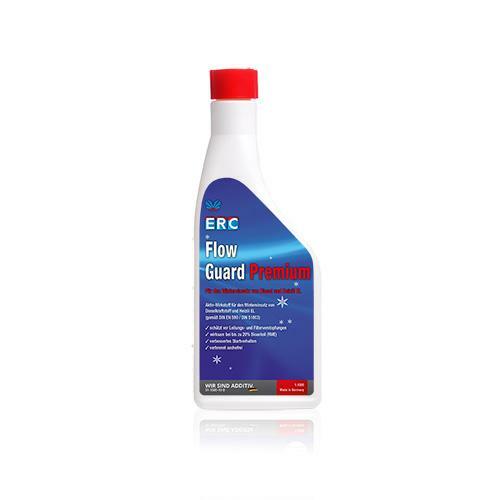 ERC Flow Guard Premium is a flow enhancer with very good mixing behaviour for the use of diesel fuel and heating oil in the winter. THE EFFECT Heating oil and diesel fuel are already relatively winter-proof, but when it is very cold, the contained paraffins can separate and agglomerate. Consequently, they clog lines and filters, in which case the heating system or the engine no longer runs properly or can even shut down. 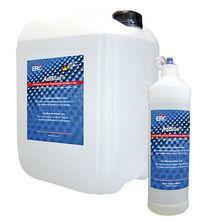 THE RESULT ERC Flow Guard Premium contains so-called nucleating agents which are available in surplus in the cooling paraffin condensation cores. As a result, smaller growth crystals form instead of larger. The minuscule growth crystals can easily pass through lines and filters without causing clogging. In addition, a surface limiter envelops the paraffin crystals and keeps them in suspension. As a result, larger clumps cannot form at a later time, either.